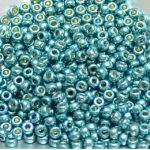 I love old beads – actually that’s part of what I love about beads and beading in general. The oldest bead ever discovered is 108,000 years old! Beads have been a part of human adornment for eons, along with being used as trade currency, status symbols, and religious amulets. While I am beading, I often contemplate this rich history and the way that beads connect us to the past. All that being said, sometimes I find it difficult to create with trade and other beads that have such historical significance. If the design is too busy they can be overlooked, too refined, and they seem out of place. So this week when I set out to make a bracelet using beads once traded in Africa, and some vintage Venetian glass beads, I thought a lot about the materials and techniques I would use for construction. After some playing around with different stringing materials, I settled on this variegated round leather cord. I first knotted the pieces (for a little added texture), added copper end tips, and connected the clasp to one end of each cord so I could braid the strands together. The copper and leather look nice and rustic together, harkening back to the materials that would have been used to string beads long ago. 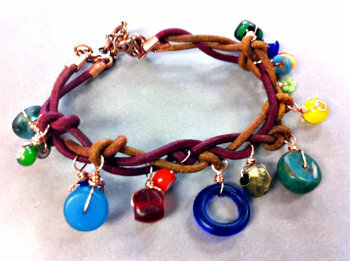 After the bracelet was constructed, I started using copper wire to make wrapped dangles out of my beads. I attached some of them to the knots in the leather, and some of them just slide along the cord. This charm bracelet style showcases the beads, and also causes me to contemplate the amuletic and totemic power that beads have been given throughout time.